NEWS IN THE SCORPION FILES! This page will have information about the recent additions to The Scorpion Files, and also information about important events in scorpion biology (The gallery is updated all the time, and picture updates will note be showed here). 07.02.08 A new species biography for Babycurus gigas has been written by Michiel Cozijn. 31.01.08 A revised species biography for Leiurus quinquestriatus has been written by Luc Ross. 07.01.08 From 2008, I will make a list of updates for each family with more information and the reference which the updates are based on. The updates can be access by clicking on the Update dates on the family pages. 19.06.07 A new scorpion family (Akravidae) has been described based on the blind, troglobitic scorpion found in a closed cave system in Israel in 2006. 11.04.07 Franz Werner's, Dr. H. G. Bronns Klassen und Ordnungen des Tierreichs - Scorpiones (5. Band, 8. Buch)(1935), is now available in fulltext on The Scorpion Files. 14.03.07 Herbst's work, Natursystem der Ungeflügelten Insekten (Viertes Heft)(1800), is now available in fulltext on The Scorpion Files. 22.01.07 Kraepelin's important work, Scorpiones und Pedipalpi (1899), is now available in fulltext on The Scorpion Files. 05.12.06 The Scorpion Files has finally gotten a figure showing the scorpions main body part and their names. A big thanks to Daniel Hill for sharing the figure with the users of The Scorpion Files! 14.08.06 The Scorpion Files has gotten a small, but positive review in the major science journal Science in July. More details here. 07.06.06 I page about the current situation in higher scorpion taxonomy and phylogeny has been added. The page also include an alternative list of valid scorpion families. 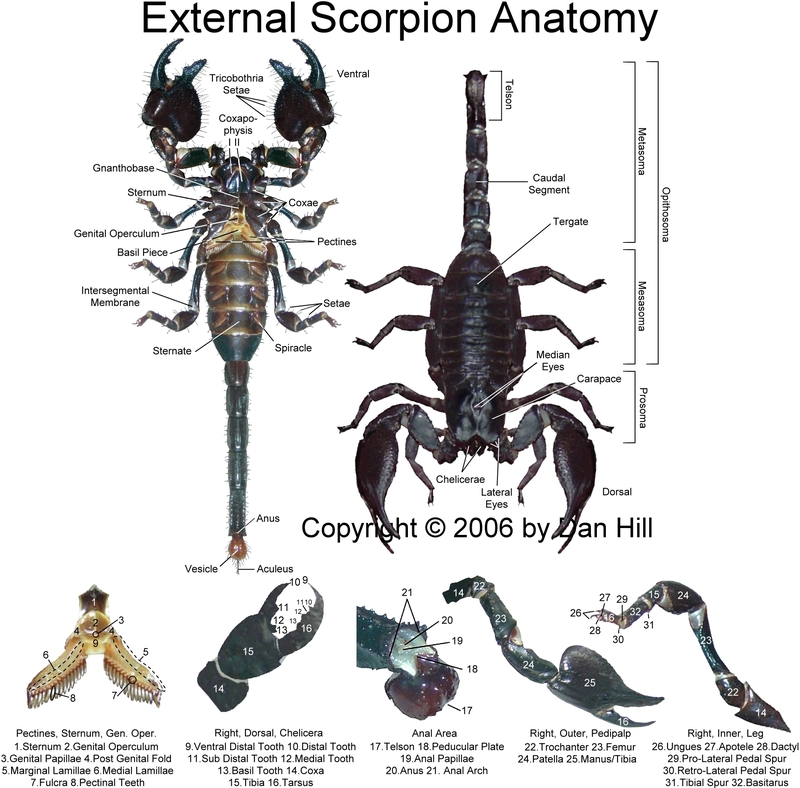 The Scorpion Files has been updated with the new taxonomic changes. 17.09.04 I'm updating The Scorpion Files all the time even though I do not write about all the changes here. Here I only tell about special news and online articles. 17.09.04 I've written some information about the scorpions of Iraq after I have gotten some inquries from peoples staying over there. Pictures of many species also available. 18.02.04 I've gotten my own tv-series about tropical invertebrates on a popular science for children on Norwegian national television. More information HERE. 02.01.04 Soleglad & Fet (2003) had published a major revision of the higher scorpion systematics. There are several important changes (some families are abolished, one new family is created, and some generas are trasfered to other families. Most changes are now incorporated into The Scorpion Files. A summary of the changes is available HERE. The whole paper is freely available in fulltext HERE (it's issue 11). 14.11.03 A gallery of SIM (Scanning Ion Microscope) pictures of Liocheles australasiae is available HERE. 12.11.03 Volum 3 of C. L. Koch's book Die Arachniden is now available in fulltext. 31.10.03 C. L. Koch's book Die Arachniden has several beatiful color drawings and I have made these available in this gallery with updated species names. 29.09.03 I've published a revised seccond edition of European Scorpions, with a lot of new information. 07.03.03 The Scorpion Files has been upgraded! I've started to use php instead of htm. This means that all files have changed url's from .htm to .php! Also, I've done some minor changes in the file structure. I will keep the old files online for some time, and also add a message in these pages about the changes. NB! If you link to http://www.ub.ntnu.no/scorpion-files/ (and not use index.htm in the end of the url), you do not need to change your url!! 17.02.03 Iurus dufoureius dufoureius habitat pictures from Crete avilable HERE..
07.02.03 Dr. Bruno Lamoral's monograph, The Scorpions of Namibia, is now available in fulltext (in the literature section). 06.02.03 A special scorpion habitat gallery has been opened. 29.01.03 Pictures of the rare Buthus atlantis and its habitat can be seen HERE. 01.08.02Androctonus crassicauda habitat picture and information from Kuwait available HERE. 22.07.02 Reginald I. Pocock's book on Indian arachnids, The Fauna of British India, Arachnida, is now available in fulltext on The Scorpion Files. 22.07.02 Reginald I. Pocock's book on arachnids of Central America, Biologia Centrali-Americana. Arachnida, is now available in fulltext on The Scorpion Files. 12.07.02 Scorpion of Brazil. New scorpion book by Dr. Wilson Lourenco soon to be released. More information about the book HERE (this is a pdf-file, and Acrobat Reader is neccessary to read the file). 10.07.02 Dr. Luis Eduardo Acosta has kindly written species files for Timogenes elegans and Zabius fuscus. 16.05.02 Gerard Dupre's major scorpion bibliography is available on The Scorpion Files. 06.05.02 Max Vachon's classic book on scorpions of North Africa, Etudes sur les Scorpions, is now available in fulltext on The Scorpion Files. 15.03.02 I've written species files for Centruroides bicolor, Centruroides limbatus and Didymocentrus krausi. The work with the medical section has started. Some information are published, but the work is only in the beginning. 01.03.02 I've written a small article about the scorpions protected by CITES. 22.01.02 I've written a review article about European scorpions. The article presents the European species, their distribution and biology. I have also made some remarks about the current taxonomical situations for some of the species. 27.12.01 The literature section has been divided into three subsections: scientific books/journals, scientific papers online & popular books. 27.12.01 I've made a contents page that has an overview of the contents of The Scorpion Files. 25.12.01 New genus (Neoprotobuthus) described by Lourenco in the family Microcharmidae. See the family file for more information. 19.12.01 I have made a page about the Scorpions in Afghanistan. 18.12.01 New online journal (named Euscorpius) devoted to scorpion biology is made available on the Internet. See the literature section for more information.